I am not a person who immediately jumps on the bandwagon of anything and definitely not when it comes to sports. You are talking to someone who commits to the team she is rooting for from beginning to end. So much so, that last year during the 2014 World Cup I cried, I mean really cried, at a bar when Argentina lost to Germany, yes that happened. I am also the person who continuously argues with her boyfriend over sports games, you name it, American football, basketball (March Madness), etc. So when I saw that Kavalan was getting big traction as the new best whisky I didn’t want to jump to try it, however, it was difficult not to when it was all people where talking about. It was even harder when the bar we walked into had it in stock. It was literally staring me on the face just begging for me to try it, and try it I did. 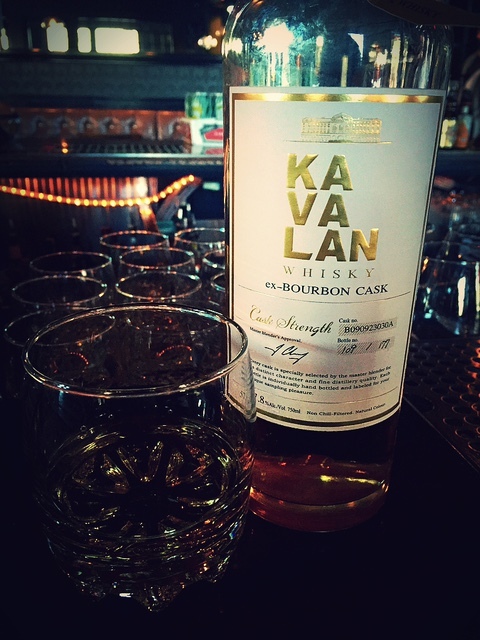 Kavalan distillery is the first and currently the only whisky distillery in Taiwan. The distillery was first established at the end of 2005 and released its first bottling in 2008. The distillery is located in the western part of Yilan County in Taiwan and is owned by King Car Group. The whisky put out by this distillery tends to mature faster than most distilleries and that is due to the Taiwanese sub-tropical climate. The warm climate does contribute to how quickly it matures. If you have not tried it then I am going to highly recommend you do, not only because it was just voted the 2015 Best Whisky in the World but because yes, it is in fact an outstanding whisky. This whisky is creamy, balanced and extremely velvety. I am glad I got the chance to try it and say that I enjoy it but at about $130+ for a bottle I am not certain I would actually purchase. I think any Scotch and bourbon lover would enjoy trying this amazing whisky that has taken the world by storm. We first experienced the amazingness of Japanese whiskies and then India too came out with whisky that shocked the world, now Taiwan. I believe that slowly, but surely, we will see more and more whisky distilleries produce quality products that aren’t from Scotland, with that said, I am a Scotch whisky gal and that will never change, I just have more options now. Cheers!